My eyes see it and my mind and heart chokes. How many more dead, injured, crippled, orphaned, traumatized and scared children are we going to see in our news? A report after a report, a story after a story. I know this is not new or isolated tragedy and many atrocities are happening in other parts of the world. But Syria alone is enough to shock and shake the global community. What happened to our “Never Again”? Chemical attack??? Growing up in Latvia and learning our history, the only time people in Latvia experienced this kind of terror was during WWI when the German army used poisonous gases in the trenches. We are still shocked and horrified and it took place in 2016. That was 100 years ago! Think about it… 100 years!!! And I thought that humanity had learned something. Yes, of course, the chemical attacks is not the only form of violence that shocks us to core. So is beheading people and torturing them and burning them alive or any other form of attack on human life and dignity. Tragically we have become so desensitized that we accept much of it as normal or inevitable. I know many people who are doing their best to help children affected by war and suffering. I support these kinds of projects and initiatives as much as possible because there is always something practical we can do. If we want to be the hands and the feet that deliver the aid, there are always possibilities and ways to do it. Also I don’t underestimate the power of our prayers. I almost hesitated to mention prayer because it can stir strong emotions. “Don’t even mention God. If there is a just and good God, why is he allowing this?” For others, they believe that God cares but they don’t believe that our interceding matters. I believe that it does matter but I also believe that we need to be ready to be the answer to our own prayers. If we pray for the children to be protected and healed and restored, we can support those who are on the ground in Syria giving this kind of help. Or those who are helping Syrian refugees in neighboring countries. Or helping the Syrian refugees in our own countries. If we pray for our governments and leaders to do something about it and for people who can make the difference to have the political will, wisdom and courage to make decisions and implement them, then we need to be ready to support those decisions. Or to keep the pressure where the will, strategy and vision is lacking. Which embassy or government building we need to protest in front of? The headlines say “The Syrian war is the deadliest conflict the 21st century has witnessed so far.” You have to agree that not just this century but this millennium has not started very well. But these children don’t need to hear about historical mistakes, geopolitics, ideologies, ambitions and the rest of our junk. They need real love and justice in action. I have a new morning routine. I am not one of those people who can jump out of the bed once awake. I take my time and try to convince myself to look forward to getting up from the warm and cozy covers. The pillow has such a magnetic pull… So, I tell myself to make something useful of this ‘wrestling match’ and check the news headlines on my phone. The backstory brought me to happy tears and it deserves much more publicity. First of all, the obvious hero in this incident is a local 25 year old guy, Ian Grillot. Someone who would be just another friendly face in a small town. Someone having a glass of beer and talking about going fishing the next day. But while he was hiding under the table and listening to the attacker firing shots, Ian was counting the bullets. Obviously he knows something about guns (as many Americans do) and he had made a fast decision to do something about this unfolding violence. I try to imagine the scene and I can almost imagine how this tragic experience has united everyone who went through it. Sadly a life was lost but also the true meaning of life was found. When Ian said that he only did the naturally right thing, I think about the power of these words and actions. When people use the slogan “Make America Great Again”, I hope they are thinking about Ian and those other brave people in the bar. Something that was meant to divide and alienate people, has had the opposite effect. The community in this little town now is connected to people in India with a much stronger bond. There are already meetings with diplomats and Indian media and all kind of connections because of this. Also, the feature photo in my blog is from a Peace March and Vigil. Thank you, Ian, for counting the bullets while not counting your own life! My current ‘office’ is a nice coffee shop in Riga where I enjoy the warmth and tasty treats. The days are getting shorter and the evenings darker. The air is much colder, too. Is it just me or the autumn is a perfect time for reflections? The global community, including Europe, is facing many challenges and it seems that news headlines change very fast. But the issues and conflicts don’t go away just because the attention shifts elsewhere. I wish I could think of Ukraine as “yesterday’s news” but I cannot. The war in the two eastern provinces – Donestk and Luhansk – is still there. Yes, there is ceasefire (mostly holding) and negotiations and different initiatives but there is no peace. Not yet. And it will not come easily. One of the things I have learned and start to experience in the times of tension, pressure and conflict is that everyone talks about “peace” but not everyone wants to be a “peacemaker”. Because honestly – real peace is counter intuitive. It goes against our emotions and our normal thoughts. It is much easier to get angry and hateful when you get hurt then to do the hard work of searching for some grace and forgiveness deep inside. It is much easier to blame. It is much easier to seek justice as in ‘eye for an eye’ but it has to be ‘my’ justice. Or even revenge as in “your whole head for my eye’. In the times of war, the peacemakers can be some of the most ‘unpopular’ people. Admired by many but hated by others. I want to honor all the men and women in Ukraine who are committed to non-violent and sacrificial resistance to any kind of oppression, corruption, aggression and hatred. I hope to meet some them in person in the future. Meanwhile one of the ways we can support peace and restoration in Ukraine is by sharing the stories of love and compassion and great sacrifice. Last year when the violence and conflict broke out, many cities organized prayer tents, including in the Constitution Square of Donetsk. 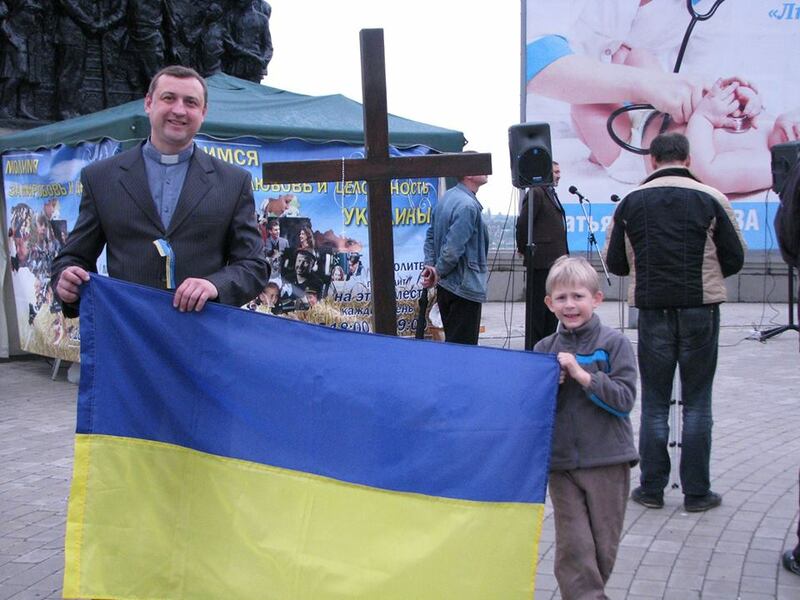 The tent was there for many months with the banner “Pray here for Ukraine” and it united people from all Christian denominations and even other religions. A local Muslim imam joined. They faced harassment, violent opposition, eggs, bottles, even rocks. Eventually the tent was removed by force and destroyed and the prayer movement had to go “underground”. Here is a story from his FB posts which Sergey Kosyak gave me permission to share. (Also all photos in this post are from his personal archive.) On May 23, 2014 he wrote: “Friends, today was a tough day, but for me very difficult. To begin with, representatives of Donetsk People’s Republic destroyed our tent, and then there was the following story. People are very angry, because, first of all, their hearts are empty and not filled with God. I told them that God loves them; I harbored no anger or hatred towards them in my heart, even when they beat me. I will not describe the beating itself, but that I am still alive, is just by the grace of God. Since my post is getting long, I will continue with other stories later. But let me finish with the same encouragement that is even truer in the dark times… Do good! It is possible! Mans patreizējais ‘ofiss’ ir jauka kafejnīca Rīgas centrā. Te ir silts un garšīgi smaržo. Dienas kļūst īsākas, un vakari tumšāki. Gaiss arī daudz aukstāks. Kāpēc rudens vienmēr mani vedina uz dziļām pārdomām? Pasaulē šobrīd ir daudz grūtību un izaicinājumu, un ziņu virsraksti strauji mainās. Taču problēmas un konflikti nekur neaiziet un nepazūd tikai tāpēc, ka mūsu uzmanība ir vērsta citur. Gribētos, kaut Ukraina būtu ‘vakardienas ziņas’, bet diemžēl tas tā nav. Karš divos austrumu apgabalos – Doņeckā un Luhanskā – turpinās. Jā, ir pamiers (kas pārsvarā tiek ievērots), tiek vestas sarunas, un ir dažādas idejas, bet miers vēl nav iestājies. Un neiestāsies tik drīz, jo smags darbs priekšā. Es sāku arvien vairāk ievērot un piedzīvot, ka ‘juku’ laikos, kad ir liels sabiedrības spiediens un konflikts, daudzi runā par “mieru”, bet ne visi vēlas kļūt par “miera veidotājiem”. Jo atklāti runājot – īsts miers nav pašsaprotams. Tas ir pat pretrunā mūsu tā brīža emocijām un domām. Ir daudz vieglāk un ‘loģiskāk’ ļauties dusmām un naidam, ja tev kāds dara pāri. Nekā cīnīties ar naidu, un meklēt sevī spēju sniegt kaut kripatiņu žēlastības un piedošanas. Ir daudz vieglāk vainot. Ir daudz vieglāk dzīties pēc taisnības, lai būtu “acs pret aci”. Vēl vieglāk dzīties pēc atriebības, lai būtu “visa tava galva pret manu aci”. Kara laikā mieru turošie var kļūt ļoti nepopulāri. Vieni viņus apbrīno, citi ienīst vai nosoda. Es gribu izteikt dziļu cieņu visiem cilvēkiem Ukrainā, kuri izvēlas cīnīties pret visa veida agresiju, korpupciju un naidu, bet ar nevardarbīgiem līdzekļiem. Tas prasa no viņiem ļoti daudz. Es ceru kādreiz satikt viņus personīgi, bet šobrīd es vēlos atbalstīt šo pašaizliedzīgo miera celšanas darbu Ukrainā, nododot tālāk stāstus par mīlestību, žēlsirdību un cerību. Pagājšgad, kad spriedze pārauga vardarbībā, daudzās pilsētās tika uzceltas lūgšanu teltis. Arī Doņeckas centrā, Konstitūcijas laukumā. Telts tur stāvēja vairākus mēnešus zem plakāta “Šeit aizlūdz par Ukrainu”, un lūgšanas apvienoja cilvēkus no visām kristīgām konfesijām. Pievienojās arī vietējais muslimu kopienas vadītājs. Viņi tika nosodīti, apsaukāti, pat apmētāti ar olām, pudelēm akmeņiem. Beigu beigās telts tika ar varu nojaukta, un aizlūdzēji nogāja “pagrīdē”. Šeit viens īss stāsts no Sergeja Kosjaka Facebook lapas. (Viņš man deva atļauju izmantot gan stāstus, gan foto.) 2014. gada 23. maijā viņš rakstīja tā: “Draugi, šodien bija smaga diena, bet man pašam ļoti grūta. Iesākumā Doņeckas Tautas Republikas pārstāvji iznīcināja mūsu telti, un pēc tam sekoja šis notikums. Vairākas reizes esmu gājis uz pilsētas administrācijas ēku, lai runātu ar Doņeckas Tautas Republikas pārstāvjiem. Tāpēc gāju arī šajā reizē. Nesatiku cilvēku, ar kuru runāju iepriekšējās reizēs, bet satiku kādu, kurš agrāk bija manā draudzē. Es priecājos viņu redzēt, bet viņš nelikās pārāk priecīgs. Viņš sāka kliegt, kas es grozot cilvēkiem prātus, utt. Vārdu sakot, nekādas sarunas nesanāca, jo viņu acīs es biju kļuvis par ienaidnieku. Un ar ienaidniekiem ir īsas sarunas. Cilvēki ir ļoti dusmīgi. Pirmkārt, viņu sirdis ir tukšas, un tās nepiepilda Dievs. Es teicu viņiem, ka Dievs viņus ļoti mīl, ka es nedusmojos un neienīstu viņus. Pat tad, kad viņi sāka mani sist. Es nestāstīšu daudz par savu piekaušanu, bet tā ir Dieva žēlastība, ka paliku dzīvs. Tur bija arī kādi, kuri zināja par mūsu lūgšanu telti. Viņi nolamāja tos, kuri mani piekāva. Tad viņi atdeva visas manas mantas un naudu un lūdza piedošanu. Lūdza, lai es neapvainojoties. Pirms tiku sists, es stāstīju viņiem par Kristu. Aicināju vērst savas sirdis uz Dievu. Lūdzu Dievu, kamēr tiku sists. Vakarā gan es netiku uz lūgšanu sapulci, jo braucu uz slimnīcu. Vēl ir daudz stāsti, bet tos vēlāk. Nobeigumā es gribu citēt vēlreiz šos iedrošinājuma vārdus… Dari labu! Tas ir iespējams!